I have had a love affair with Brussel sprouts lately. During the winter, I was often eating my maple glazed brussel sprouts, but they are great raw in a salad as well! I already have on Brussel sprouts salad on the blog. 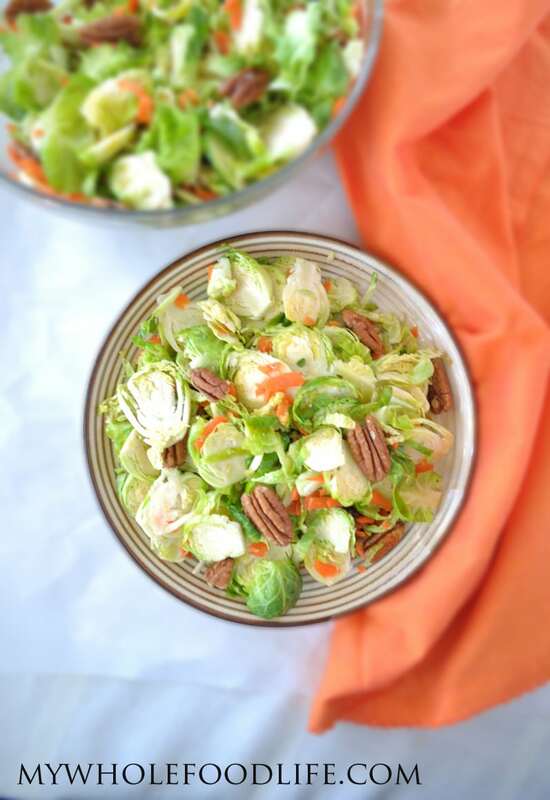 Now it’s time to add this Brussel sprouts salad with orange ginger dressing to the mix. 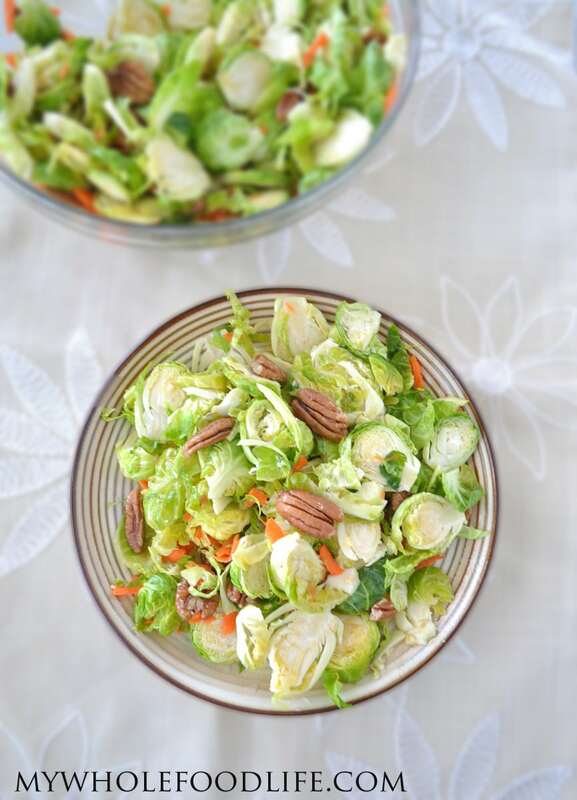 This Brussel sprouts salad is super easy to make and it will make you feel energized! Love all the flavors in here. An energizing and healthy salad! Wash the Brusell sprouts, remove the ends and slice thin sideways. You can also just shred them using a shredder or mandolin. Add the Brussel sprouts, carrots and pecans to a bowl . In a small bowl, whisk the dressing ingredients together. Pour the dressing over the salad. You can serve immediately, but I think the salad gets better if it sits a couple hours. The flavors really marinate and develop more the longer is sits. This should last 4-5 days in the fridge. 1bag=??? I bought mine bulk/loose and am not sure of quantity. Looks yummy! Mine came in a bag of about 30 Brussel sprouts. That is an eyeball guess. I am not sure how I feel about this salad. I love cabbage but have not eaten Brussels sprouts till fairly recently. I think my orange was not sweet enought and the ginger made My salad a little too otter. Also, I want more vinegar in it. I am German, I like vinegary things. Also, I ended up steaming Brussels sprouts a little. With that being said, I think your palate is more accustomed to those flavors. Do you have a recipe for Brussels sprouts for a novice by any chance ? Thank you! I'll definitely try those recipes!